Apni Shala was founded in 2011 by Tata Institute of Social Sciences graduates Swetha Ranganathan, Anukriti Goyal, and Amrita Nair. Ranganathan, Goyal, and Nair realised that a sound education should ensure emotional and social development, and that children from low-income backgrounds may experience additional hardships that slow this development and contribute to high school-dropout rates among vulnerable populations. Recognising a need, the to-be founders came together to build a programme that would cater specifically to the socio-emotional needs of their target demographic. Apni Shala was officially registered in 2013. "The biggest impact is the trust we have built. Our first call or e-mail by default, is to Atma. The best part is that in the three years of Accelerator support, we didn't feel like Atma was mentoring us. It felt as if Atma was a part of Apni Shala, helping us at every step." Apni Shala partnered with us as part of Atma’s flagship programme, the Accelerator. Their strategy greatly improved during the partnership. Swetha Raganathan recalls “The AIP [for 2014 – 2015] done with Lisa was an amazing exercise that was really useful and where we could get so much knowledge about how to do strategy planning.” The SWOT Analysis was also helpful for identifying Apni Shala’s strengths and weaknesses and when planning future funding needs. During the partnership, Atma and Apni Shala completed more than 30 projects to strengthen four major organisational development areas (Strategy, Human Resources, Programmes, and Monitoring & Evaluation). Support was also provided in Marketing, Finance, and Fundraising. 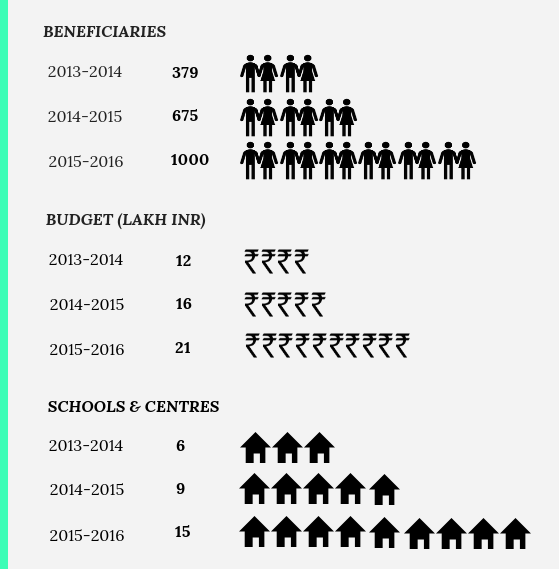 Over the course of the partnership, Apni Shala increased its beneficiary reach 2.6 times and is now operating in 2.5 times more schools / centres. Its budget was multiplied by 1.75 and 40 teachers and 8 staff members have joined the three founders.